Das Deutschlandlied ("The Song of Germany", also known as Das Lied der Deutschen, "The Song of the Germans") has been used wholly or partially as the national anthem of Germany since 1922. Outside Germany it is sometimes known by the opening words and refrain of the first stanza, Deutschland über alles (Germany above all), but this has never been its title. The music was written by Joseph Haydn in 1797 as an anthem for the birthday of the Austrian Emperor Francis II of the Holy Roman Empire. 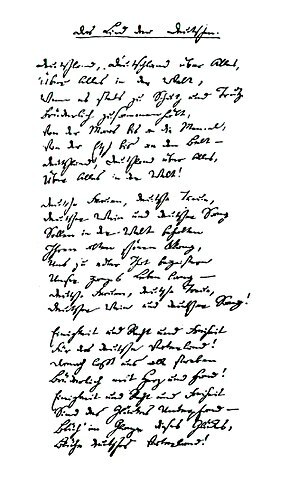 In 1841 the German linguist and poet August Heinrich Hoffmann von Fallersleben wrote the lyrics of "Das Lied der Deutschen" to Haydn's melody, lyrics that were considered revolutionary at the time. The song was chosen for the national anthem of Germany in 1922, during the Weimar Republic. In 1952, West Germany adopted Deutschlandlied as its official national anthem, with only the third stanza sung on official occasions. Upon reunification in 1991, the third stanza only was confirmed as the national anthem.— Excerpted from Das Deutschlandlied on Wikipedia, the free encyclopedia. Facsimile of Hoffmann von Fallersleben's manuscript of the Lied der Deutschen. This page was last edited on 27 April 2018, at 16:50.